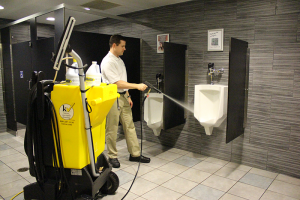 Ideal for schools, colleges, airports, convention centers, stadiums, hospitals, factories, warehouses, movie theaters, and large professional office buildings, our “No Touch” cleaning system and processes are designed to remove the maximum amount of bio-pollution and sources of odor by utilizing specialized chemicals and equipment. High pressure cleaning. Removes soils and bacteria that can’t be cleaned by hand. Odor source removal. Leaves restrooms smelling fresh by removing all sources of odors, especially in hard to reach areas. Convenience. Prevents you from having to purchase and stock expensive and unnecessary equipment. Clean and safe restrooms. Your customers and employees will be protected from bio-pollutants and bacteria.